The global intraoperative imaging market is predicted to grow at 6.1% CAGR during the forecast period with the market size reaching USD 2.6 billion by 2024. Different products such as mobile c-arms, intraoperative computed tomography, intraoperative magnetic resonance imaging, and intraoperative ultrasound are majorly contributing to the intraoperative imaging market size. The market has witnessed significant demand for mobile c-arm over the last few years due to the mounting occurrence of cardiovascular diseases, and expanding number of orthopedic surgeries. Intraoperative imaging is an imaging technology which helps in surgical procedures. It helps surgeons to capture a real-time view of the organ during the surgery and assists in demanding control and monitoring of the surgical procedures. It is extensively recognized in several fields of medical sciences owing to technological advancements and high precision. Based on product, the intraoperative imaging market is categorized into mobile c-arms, intraoperative magnetic resonance imaging, intraoperative computed tomography, and intraoperative ultrasound, of which intraoperative computed tomography hold the largest share in the intraoperative imaging market, globally. The mounting occurrence of cardiovascular diseases, and expanding number of orthopedic surgeries led to the fastest growth of the mobile c-arms segment during the historical period, which is also predicted to continue during the forecast period. On the basis of the application, the intraoperative imaging market is segmented into neurosurgery, cardiovascular surgery, orthopedic & trauma surgery, spine surgery, and other applications. Of all, the neurosurgery application is predicted to witness the highest CAGR of 7.3% during the forecast period and accounted the largest share in the intraoperative imaging market due to an upsurge in usage of minimally invasive surgeries for the neurological procedure, usage of neurostimulation device for the management of neurological disorder, and mounting occurrence of neurological disorder. The different end users in the market are the hospital, and ambulatory surgical centers (ASCs). Of all, the intraoperative imaging market size for ambulatory surgical centers (ASCs) is expected to grow at the fastest rate during the forecast period, globally. In addition, of all end users, hospitals accounted for the largest share of the market, due to increasing number of patients enduring treatments in hospitals, execution of government initiatives for fixing intraoperative imaging systems in hospitals, and escalating number of hospitals in developing countries. 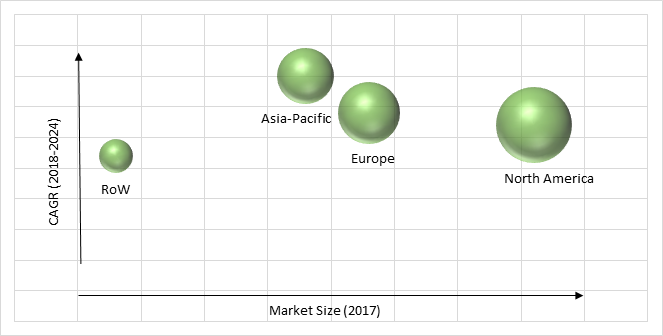 Expanding the geriatric population, the mounting occurrence of chronic diseases and lifestyle associated diseases, escalating awareness about intraoperative imaging, and escalating inclination towards minimally invasive surgery are the key factors leading to the growth in the intraoperative imaging market, globally. For instance, according to GLOBOCAN globally, approximately 14.1 million new cancer cases were diagnosed and there were 8.2 million cancer deaths in 2012. In addition, according to the World Health Organization (WHO), in 2015 approximately 8.8 million people died due to cancer. Moreover, approximately 70% of the deaths from cancer occur in low and middle-income countries. Owing to the benefits of minimally invasive surgery such as less pain, speedily recovery, and shorter hospital stay, various intraoperative devices are used in the intraoperative imaging. Some of the other key factors driving the growth of the industry are the expanding application of neurosurgery and orthopedic surgery, favourable reimbursement policies, technological advancement and escalating demand for intraoperative imaging systems. Geographically, North America is the largest intraoperative imaging market as the region the demand for the minimally invasive procedure is increasing and well-developed healthcare infrastructure. In addition, the mounting occurrence of chronic diseases and lifestyle associated diseases, and expanding geriatric population are also fueling the growth of the North American intraoperative imaging market. For instance, according to GLOBOCAN in the U.S., approximately 1.6 million new cancer cases were diagnosed and there were 0.6 million cancer deaths in 2012. Asia-Pacific is observed to witness significant growth in the intraoperative imaging market during the forecast period, as the region comprises of a large population, government initiatives in establishing innovative technologies, and refining healthcare infrastructure. Moreover, intensifying healthcare expenditure, expanding the geriatric population, growing occurrence of orthopedic disorder, demand for refined medical service, and mounting occurrence of chronic diseases and lifestyle associated diseases are also facilitating the significant growth of Asia-Pacific intraoperative imaging industry. Market players in the intraoperative imaging industry are investing capital to develop technologically advanced systems. In November 2017, Ziehm Imaging strengthens its position in mobile C-arm imaging by the introduction of CMOS line, which completes CMOS portfolio from compact mini C-arms to powerful high-end devices. Medtronic Plc, Ziehm Imaging GmbH, General Electric Company, Koninklijke Philips NV, Toshiba Corporation, Siemens AG, Brainlab AG, and Shimadzu Corporation are some of the key players offering solutions for intraoperative imaging.